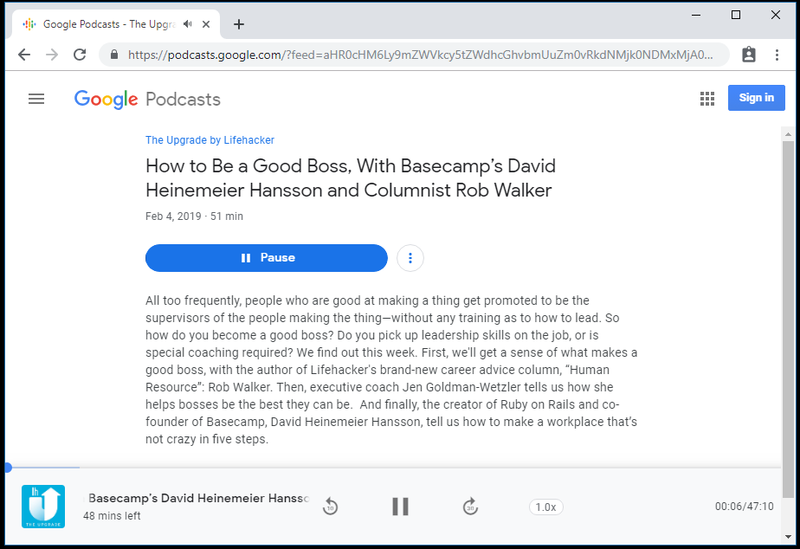 Google Podcasts is a relatively new podcast service, and while its current focus is its mobile app, there are a couple of features hidden away in a browser version that aren’t normally accessible. Specifically, users can play podcasts in their browser and pull auto-generated transcriptions for episodes with just a few tweaks. 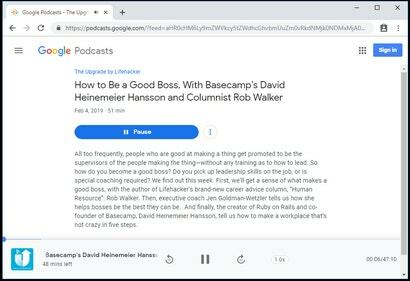 Normally when you open an episode link from Google Podcasts on a desktop browser, you’re sent to a download page for the Google Podcast app, rather than a direct link to the episode itself. However, as Android Police points out, a small change to the URL is all it takes to enable browser playback. This workaround will likely be replaced by a fully featured web player in the future, but it’s helpful in the meantime. You won’t be able to search, subscribe, or access other podcast feeds you follow (you’ll need to pull each link directly), but your listening progress does sync between the web and app versions. Open the Google Podcasts app on your Android device. Find the episode you wish to play in your browser. Tap the “More” icon (three stacked dots) & “Share”, then either send the link to yourself through one of the available apps, or copy the link to your clipboard and send/save it another way so you can open it in a browser on your PC or other devices. On your PC, copy and paste the episode link in your browser. Change the first part of the URL from “www.google.com/podcasts” to “podcasts.google.com” (make sure to keep the string of numbers and letters that follows untouched), then hit Enter. You’ll be taken to the episode’s in-app page. You can press play to listen, or click the Podcast’s title to open the episode list. Another hidden feature in Google Podcasts is auto-generated transcriptions — much like the auto-caption feature for YouTube videos. These transcriptions are used as metadata by Google Podcasts (and will likely be searchable by users in the future). However, you can currently find these transcriptions with a little digging around — though these aren’t a replacement for listening to the show itself, since they appear as a single unformatted string of text, they aren’t super-accurate, and they are not available for all podcasts or episodes. Like the web player, this wonky workaround will probably be replaced at some future point, but for now, you can at the very least copy and save the transcriptions and search through them yourself. Follow the steps above to share and edit an episode link from the Google Podcasts app so that it can be played in a Chrome browser. 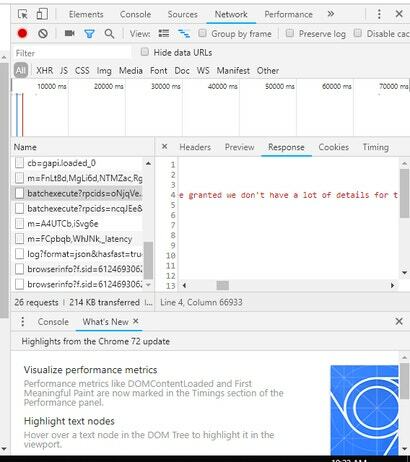 Once the episode page is open, press play, and then hit F12 to open the page source window. The “Name” window will populate with a list of files. 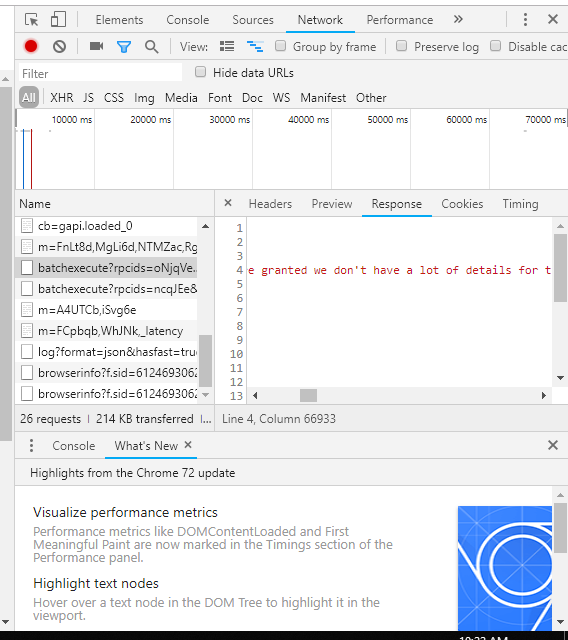 Scroll through these files until you find one that begins with “batchexecute?rpcids=.” Click this to open it in the adjacent window, then use the scroll tabs to find the transcription text. You can see the example from the screenshot above. Paste this string into a text document (such as Word, Google Docs, Notebook, etc.). Press Ctrl+F to search the text document.